If this card is Link Summoned: You can discard 1 card, then target 1 Spell/Trap your opponent controls; destroy it, then, if this card was co-linked when this effect was activated, you can draw 1 card. You can only use this effect of “Knightmare Phoenix” once per turn. Co-linked monsters you control cannot be destroyed by battle. Knightmare week continues with another Link Monster: Knightmare Phoenix. Like Goblin yesterday, it takes two to tango, two monsters with different names is easy. Has effects if Link Summoned, so Special Summoning it from the grave may not be as useful, like all Knightmare Link monsters. 1-for-1 spell/trap destruction your opponent has with the discard from you. You get a draw if you are co-linked, which makes it go to a +1. Protection for the co-link like Goblin makes Phoenix great like Goblin. The arrows also help Phoenix be co-linked, pointing up to your Extra Monster Zone and to the right. 1900ATK is higher than Goblin too. Is Phoenix better than Goblin? It depends on the situation. You want monster removal, but spell/trap removal is just as important. Phoenix is easier to go co-link with, and that extra draw off the effect is so key. 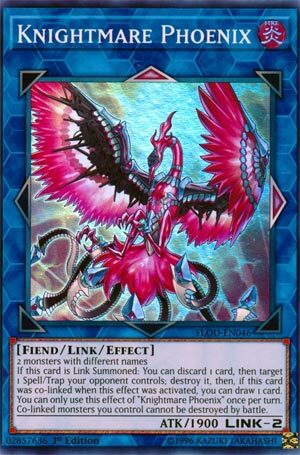 Very similar to Yesterday’s card, Knightmare Phoenix is a Link 2 Fire Fiend-type Link Monster with 1900 Atk and Up and Right Arrows. Again, you need two differently named monsters to Link Summon it properly. For your trouble, upon Link Summon you have a hard once per turn effect of targeting a Spell or Trap for destruction at the cost of a discard. If Phoenix is co-Linked at the time of activation, you get to draw a card as well. This reminds me of Breaker the Magical Warrior as a splashable quick answer to back row cards. Even the 1900 Atk is the same (1600+300 with counter). However, Phoenix is going to see more play since there is a chance for the draw effect as well. As a bonus, just having Phoenix on the field protects any co-Linked monsters from destruction by battle. Goblin has a better protection effect, but Phoenix has higher Atk. This averages to about the same score. This is certainly more versatile because of the arrows. Next up in Knightmare week is one of the two Knightmares that are likely going to be staple in most Extra Decks, Knightmare Phoenix. Phoenix is a Link-2 FIRE Fiend requiring two monsters with different names, has an ATK of 1900, and arrows pointing Up and Right. Arrows are fine considering this is meant to co-link and get the Extra Link. 1900 ATK is solid. FIRE is a meh attribute sadly, but Fiend again is a good type. When Phoenix is Link Summoned, you can discard one card to destroy 1 Spell/Trap the opponent controls and if this card is co-linked, you can draw 1 card. Same discard effect and draw if co-linked, but Spell/Trap removal will always be good. This is a hard once per turn effect of Phoenix, which you will notice a lot with these Knightmare Links. While Phoenix is co-linked, your co-linked monsters cannot be destroyed by battle. Battle protection will never get outdated, even with other forms of removal, because battling is still key in this game when it comes to winning. You got to get your opponent’s LP to 0 somehow. Phoenix has two great effects that makes him worth being staple in any Extra Deck, either to get it co-linked or just climb the Link Ladder. Art: 4.25/5 Love the color of Phoenix. Knightmare Phoenix is next up, also a Fiend (recurring theme much) who is Link Summoned with two differently named Monsters (again) and this time sports 1900 attack, and is a Fire attribute (appropriate for a Phoenix, though Fire Fiends are rare). Here, the arrows point directly above and to the immediate right. This card has a similar mechanic to yesterday, as when co-linked, if you discard a card from your Hand, you get to Draw a card, but also, you target a Magic/Trap card your opponent controls and destroy it. This is a 2-for-1 in your favor, if successful. You give up one card, but your opponent loses one, and you get one back. This, again, like yesterday, is definitely once per turn, but has the added benefit also of being able to protect co-linked Monsters you control from being destroyed in Battle. Which helps the theme tremendously. It’s slightly different than yesterday, but just as good, and I’ll say again, in or out of the theme. Destruction and protection, and the 1900 attack is solid too for a Link 2. Art: 4.5/5 I like the Goblin a bit better, but this is still magnificent.